Christen's Creations | Creative Expressions from a fiber artist, beader, ribbon artist and embroiderer. Bead Work • Ribbon Work • Embroidery • Fiber Art • Wearable Art • Accessories • Dolls of Distinction • Digital Endeavors • The Occasional Poem and Short Story . If you would like to contact me or put your name on my mailing list, please click here. I want to thank each and everyone of the wonderful artists that participated in the blog tour, and to all of you readers who followed the tour! I am proud to announce that my book on bead embroidery and bead weaving is HERE! Within the 160 pages of Beaded Embroidery Stitching you will find information on the types of beads and embellishments that you can use in the 125 bead-embroidery and bead-woven stitches. There are over eight projects, ranging from beginning to advanced, including wallhangings, a sewing caddy, jewelry, and more. I have included additional inspiration for each project, showing a different color way, or a different take on the design, and a gallery section for more ideas. There are some amazingly talented people that are participating in this tour. I want to thank each and every one of them for agreeing to participate in the launch of my new book. 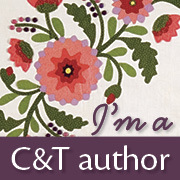 Please visit their blogs to read what they have to say, and for a chance to win an ebook of Beaded Embroidery Stitching.